Volunteer Collections Centre guide Cameron Slater tells an interesting story relating to nostalgia and how one car in the collection brought back teenage memories. One of the satisfying things about being a guide in the Collections Centre is seeing people’s reactions to cars that were once important to them. It’s the Nostalgia Factor and we see it all the time. “I passed my test in one of those” or “My dad used to have one of those” or “That was my very first car”. Now, although I can tick off four cars in the Museum that I have owned at some point in my classic car career, I was never particularly affected by the Nostalgia Factor because I’ve got loads of photographs of them and some very vivid memories of good and bad times with all of them. Until, that is, I started putting together my tour for visitors to the Collections Centre. I usually begin on the first floor with the 1900 Daimler and contrast it with the 1950 Green Goddess Daimler which neatly illustrates 50 years of automotive development by the same company. It’s a good talking point and gets people thinking about the differences between the two Daimlers and about the way cars have developed over the years. My next talking point is the 1912 Rover Landaulette which, at some stage, belonged to Lord Catto, who became Governor of the Bank of England in the 1940’s. So there’s a lot of mileage (sorry!) in this car in terms of the changing role of the motor car and the rise of the car as a part of business life and the distinction between the wealthy owner and the not-so-wealthy driver or chauffeur. As I did some research into the history of the Rover, however, I discovered that it had been part of the Sword Collection. Now for those of you who think this is part of the Royal Armouries in Leeds, let me set you right. John Cuthill Sword, born in Airdrie in 1892, was a wealthy businessman in the West of Scotland who built up a transport empire which included Western SMT Buses, well known to all who travelled in Glasgow and the west of Scotland in the 40’s and 50’s and Midland and Scottish Air Ferries, which flew out of Renfrew airport and which, much later, became British Midland. Over a number of years, Sword amassed an outstanding collection of veteran and vintage cars, many with a Scottish connection. So there were Albions, Arroll-Johnsons, Beardmores and Argylls as well as Daimlers, Sunbeams and other famous and exotic marques. Sword died in 1960 and part of the car collection was put up for auction in 1962, and this is where my nostalgic memories begin. I would be about 15 or 16 at the time and totally obsessed with cars of all kinds since childhood. My dear old Dad suggested that he would take me to East Balgray, the Sword estate in Ayrshire to the viewing day for the Sword Collection auction. Of course I jumped at the chance and we made our way into rural Ayrshire along with a large proportion of the petrol heads of all ages in Glasgow and the West of Scotland and places much further afield. The cars were stored in barns and sheds and my recollection, at a distance of more than fifty years, is that most of them seemed to be in pretty poor condition. But this was a major sale because some of the cars were very rare and most of them had never been seen since Sword acquired them. All this came back to me when I was looking into the history of the Collections Centre’s Rover Landaulette. And the Nostalgia Factor was not so much about the cars, but about my old Dad who’s been dead for more than twenty years now. He was often a bit distant and his job meant he spent a lot of time away from home, but on that weekend in 1962, he must have thought that I would enjoy seeing these marvellous old cars and that it would be a day out for just the two of us. It had the added effect that it brought us a bit closer together; not only did he start letting me drive his company car – which was a pretty risky thing for him to do (away from the public roads of course) - but when the time came, he got me through my driving test at the first attempt, aged 17. 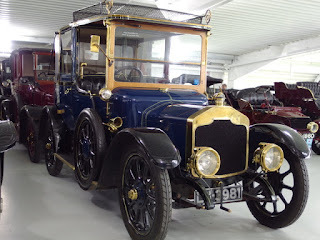 And I never looked back – at least not until I discovered that the 1912 Rover Landaulette in the Collections Centre had been in the Sword Collection all those years ago.